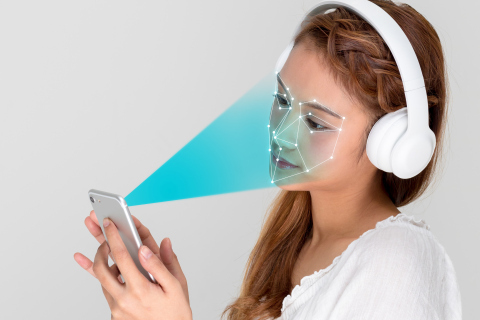 IDEMIA, the global leader in Augmented Identity, is bringing electronic device makers its expertise in biometric security with IDEMIA 3D Face, software that uses 3D facial recognition to unlock smartphones quickly and easily. According to a study by Counterpoint Research, although 66% of device makers currently opt for fingerprint sensors, they are increasingly turning to biometric facial recognition technologies. In 2020, all new smartphones will feature biometric sensors. Therefore, facial recognition is set to become standard, creating a more secure and ergonomic user experience. The IDEMIA 3D Face facial recognition solution, which was unveiled at the 2018 Mobile World Congress and pioneers 3D acquisition technologies, reflects smartphone users’ demand for simplification, efficiency and security. IDEMIA is now the leader in biometric solutions across all industries around the world. The group works with the most advanced algorithms, primarily based on Artificial Intelligence and tested on all user groups. In this context, IDEMIA 3D Face presents cutting-edge technology that can accurately calculate face geometry in three dimensions using the invisible light of an infrared camera, providing unrivalled levels of security. The solution also delivers an optimal user experience, combining convenience, reliable recognition and comprehensive security. IDEMIA 3D facial recognition is now compatible with all smartphones featuring capture ability. The solution is creating the potential for future uses: tomorrow, it could be incorporated into vehicle technology, for example, and recognize each car’s owner — or even identify abnormal behavior such as the driver falling asleep at the wheel. "We’re proud to have the new IDEMIA 3D Face within our range of high-tech solutions. IDEMIA 3D Face represents what IDEMIA does best, i.e. combining product security and convenience with advanced 3D facial recognition technology. Although smartphones are commonplace, it’s essential to adapt the features to our lifestyles. So IDEMIA is providing a solution that’s ahead of its time and highly secure for regular, effective and simplified use," says Yves Portalier, EVP and GM of the Connected Objects Business Unit. OT-Morpho is now IDEMIA, the global leader in Augmented Identity, with the ambition to provide a secure environment enabling citizens and consumers alike to perform their daily critical activities (such as pay, connect, travel and vote), in the physical as well as digital space.